Volume III of this acclaimed series is now available in an abridged paperback edition. The result of years of work by scholars from all over the world, The UNESCO General History of Africa reflects how the different peoples of Africa view their civilizations and shows the historical relationships between the various parts of the continent. Historical connections with other continents demonstrate Africa's contribution to the development of human civilization. Each volume is lavishly illustrated and contains a comprehensive bibliography. Volume III documents the increasing influence of Islam and its dissemination and interaction with traditional African culture in northern and western regions. 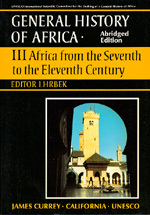 The essays place Africa in the context of world history at the opening of the seventh century and examine the impact of Islamic penetration, expansion of the Bantu-speaking peoples, and the growth of civilizations in West Africa.